Dear people who cling to the merits and worthiness of Christ: Grace, mercy, and peace to you from God the Father and our Lord and Saviour Jesus Christ. Amen. “He is worthy to have you do this for him.” This is what the Jewish elders said to Jesus concerning the centurion when they requested His help. They said the centurion is worthy because he loved the Jewish nation. Unlike most Roman soldiers, this centurion didn’t despise the Jewish people. In fact, he loved them. He built a synagogue for the Jewish people to gather and hear God’s Word, most likely with his own money. And unlike many slave owners, the centurion didn’t regard his slave as replaceable property, but cared enough for him to ask Jesus to heal him. Surely he is worthy. Surely based on what he has done, this centurion deserves to have his request granted by Jesus. Or so the Jewish elders thought. This is the same error into which the Galatians fell. The Galatians had been tricked by false teachers into thinking that man can do something to earn God’s favour. They believed that if they did good things, then God would give them good things. They believed that if they did what they could, then God would do the rest. They believed that they had to work to make themselves worthy to receive from God. If you want to earn God’s favour, you have to keep the entire law – every single commandment. In your entire life, you can never have a sinful, impure, or selfish thought. In your entire life, you can never speak poorly of anyone or tell even a “little white lie.” In your entire life you can never act selfishly, but must always put others first. Since no one can do these things, anyone who relies on their ability to fulfil the Law is under a curse. They are under a curse because they cannot abide by all the things written in the Book of the Law, and do them. This is why Saint Paul is so adamant, unyielding, and unbending when he writes, “If anyone is preaching to you a gospel contrary to the one you received, let him be accursed.” Even if it’s an angel from heaven, let him be accursed. There is no gospel other than the Good News that we receive God’s favour only for Jesus’ sake without any merit or worthiness in us. There is no gospel other than the Good News that we are declared righteous, our sins are covered, and we are given the promise of eternal life as a free gift apart from our works; apart from what we have done; apart from what we have left undone. The Holy Spirit says through Saint Paul that anyone who says otherwise is accursed. The Jewish elders had it all wrong. The centurion was not worthy. The Gentile centurion himself recognizes and acknowledges that this is true. He sent word to Jesus saying, “Lord, do not trouble yourself, for I am not worthy to have you come under my roof.” He laid no claim on anything he had done. He knew he did not deserve his request for the healing of his servant, nor was he worthy even to have Jesus come into his house. He knew he is unworthy for what he asked, and was unworthy of even being in Jesus’ presence, yet he asked anyway, trusting in the mercy of Jesus. We can sometimes get caught up in thoughts of worthiness as the Jewish elders did. We can fall into the trap of thinking that certain people are worthy of the church’s services and others are not. We may think that someone who has shown great love to others is worthy while others are not. Someone who has been a great supporter of the church and has been a regular attender deserves the support, the visits, and the services of the church, while those who haven’t given much or attended much are unworthy and don’t deserve such support, visits, or services. We may think that those who support the church and attend are those who are worthy to have their prayers answered by God, while others are unworthy. The truth is we are all unworthy sinners. We have all sinned and fall short of the glory of God (Rom. 3:23). So is the answer to everything to recognize and acknowledge our unworthiness? Is that the whole answer? All we have to do is admit that we are unworthy for what we ask and then God will give it to us? No, that’s not quite it. If all we do is recognize that we are unworthy, we will despair. If all we do is realize that we are unworthy, we will be miserable. Our unworthiness by itself, causes us to push God away. Recognizing our sin, as Peter did, we say, “Depart from me, for I am a sinful man, O Lord.” (Luke 5:8) Our unworthiness makes us exclaim with Isaiah, “Woe is me! For I am lost; for I am a man of unclean lips, and I dwell in the midst of a people of unclean lips.” (Is. 6:5) Despairing in our unworthiness we run away from God to hide like Adam and Eve did when they sinned (Gen. 3:8). If all we recognize is our unworthiness, we flee from God. We are afraid to pray to Him because we are unworthy. We avoid the Divine Service because we are not worthy. We flee from the Lord’s Supper because we are afraid to receive it unworthily and eat and drink judgment on ourselves (I Cor. 11:27-29). We cannot just recognize our unworthiness and stop there. Along with the centurion, we should recognize our unworthiness, but also recognize who Jesus is and trust in Him for salvation. The centurion recognized that Jesus has divine authority. Just as the centurion had authority to command his soldier “‘Go,’ and he goes; and to another, ‘Come,’ and he comes; and to [his] servant, ‘Do this,’ and he does it,” so Jesus has authority to command illnesses to go and they go, or for illnesses to come and they come. Just as the centurion doesn’t need to explain or justify himself to his soldiers, so Jesus doesn’t have to explain or justify himself to the centurion, to us, or to anyone else, whether the illness comes or goes. Jesus says all authority in heaven and on earth has been given to Him (Matt. 28:18). He has authority to make sick, He has authority to heal. Like the centurion trusted Jesus, we can also trust that He knows what He is doing, that He loves us, wants what is best for us, and will answer our prayers as He knows best, and for our eternal good. We can pray for all things, not because of our worthiness or merits, but because of the worthiness and merits of Jesus. The centurion trusted in the power of Jesus’ Word to the extent that he did not even need to see Jesus himself. So we also can trust Jesus’ Word even though we do not see Him. Because Jesus has all authority in heaven and on earth, we know that He has the authority to cover all of our sins in the waters of Baptism. Because Jesus has all authority in heaven and on earth, we know that He has authority to forgive sins through the mouth of the pastor He calls to speak in His name and in His stead. Because Jesus has all authority in heaven and on earth, we know that He has authority to give us His true body and blood for the forgiveness of all of our sins and that we receive it worthily, not trusting in our own worthiness, but in the worthiness of Jesus. Jesus says to our fears, “Go,” and they are gone. Jesus says to faith, “Come” and it comes to us. Jesus says, “Do this,” and we eat and drink, doing this in remembrance of Him. Jesus has all authority in heaven and on earth, and He commands and invites us to pray based on His merits and worthiness. His worthiness covers our unworthiness. His blood shed for us covers our sins so that we might be granted those things for which we pray according to God’s good and gracious will. We are not worthy in and of ourselves that Jesus would come to us in His true body and blood for the forgiveness of all our sins, but Jesus’ worthiness covers our unworthiness. We worthily receive the Lord’s Supper when we recognize our own unworthiness and cling to the worthiness of Jesus who gives to us what He has promised in the Sacrament: the forgiveness of sins, life, and salvation. That is the Gospel. There is only one Gospel. That Gospel is the Good News that we receive God’s favour only for Jesus’ sake without any merit or worthiness in us. That one true Gospel is the Good News that we are declared righteous, our sins are covered, and we are given the promise of eternal life as a free gift apart from our works; apart from what we have done; apart from what we have left undone. We receive it all clinging to Jesus’ worthiness. Amen. Dear people who will never see death: Grace, mercy, and peace to you from God the Father and our Lord and Saviour Jesus Christ. Amen. When God revealed His name to Moses as “Yahweh” or “I AM,” it is not the first time God’s name appears in Scripture. Already in Genesis chapter two the name “I AM” appears multiple times when describing His creation of man and woman and His placing of them in the Garden of Eden. The name “I AM” is the most frequent name for God in the Old Testament, appearing over 5000 times. “I AM” is God’s holy name. Out of fear of taking God’s name in vain, the Jews of Jesus’ time never uttered it. They were so scared of breaking the Second Commandment that they never spoke God’s name in prayer or worship. Even when reading from the Scriptures in synagogues, they would say “Lord” instead of “I AM,” which is written in the text. So you can imagine the outrage of the Pharisees when Jesus describes Himself as “I AM.” The Pharisees, as usual, were arguing with Jesus. Jesus said, “If anyone keeps my word, he will never see death.” This set the Pharisees off in an uproar. They said, “Now we know that you have a demon! Abraham died, as did the prophets… who do you make yourself out to be?” The Pharisees did not understand Jesus was talking about eternal death and that Abraham and the prophets are alive with God in Paradise even though they died from this life. Genesis tells us about I AM appearing to Abraham and speaking with him. I AM made promises to Abraham and made a covenant with him. I AM called Abraham out of his country and promised to make a great nation of him (cf. Gen. 10-25, esp. 18). This was more than two thousand years before Jesus’ conversation with the Pharisees. So how can Jesus claim that Abraham saw Him? What is Jesus saying about Himself? That’s why the Pharisees picked up stones to stone Jesus to death. Not only was He speaking God’s name, He claimed to be I AM, the one and only true God. In their eyes, this was blasphemy. Someone is guilty of blasphemy if he claims to be God and is merely a man. Recall that this was the only charge against Jesus of which He was found guilty in His trial before the Council. Jesus’ words left the Pharisees with two options: believe that Jesus is God or believe that Jesus is some lunatic claiming to be God. There are no other options. If Jesus was just a prophet of God, but not God in the flesh, then He would not have claimed to be God. No other prophet sent by God ever claimed to be the eternal I AM. If Jesus was a good teacher but nothing more, then He would not have said that Abraham had seen His day and was glad. No teacher is good who makes up such lies. Either Jesus is God or He’s crazy. There are no other options. This means that you also only have those same two options to believe. Either Jesus is the great I AM, Yahweh, God in the flesh, or He is a lunatic and a liar. Either Jesus is right when He says, “Truly, truly, I say to you, if anyone keeps my word, he will never see death,” or He is a liar and we should discard His every word. It’s all or nothing. Any thinking that Jesus is anything other than I AM in the flesh is false. This is why today, being Trinity Sunday, we will confess in the Athanasian Creed that along with the Father and the Holy Spirit, the Son is equal in glory and majesty, that He is uncreated, infinite, eternal, and almighty. Although He is the eternal I AM, the Son humbled Himself by taking on flesh and becoming man. Although equal with the Father and the Holy Spirit as God, the Son humbled Himself to be a man, and thus to be less than the Father according to His humanity. 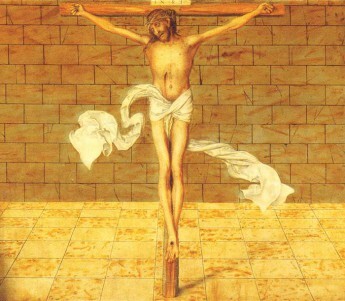 Even more, He humbled Himself to the point of suffering and death. The eternal I AM who has no beginning or end, before whom no god was formed and after whom no god shall be, the great I AM, besides whom there is no saviour gave His life for fallen man. The Creator of the universe died for the sake of His creation that has rebelled against Him. So great is His love towards us. Since Jesus is the eternal I AM who kept His promises to Abraham, we know that He will also keep His promises to us. Whoever keeps Jesus’ Word will never see death, because Jesus saw death instead. Whoever trusts the promises of God has the promise of eternal life. These promises to you are sure and certain because the eternal I AM has made them to you. He who has no beginning or end promises you that you will have no end. He before whom no god was formed and after whom no god shall be promised you in the waters of Holy Baptism that you belong to Him. The eternal I AM gives you His very body and blood to eat and drink making you eternal by giving you eternal life. I AM saved His people Israel out of slavery in Egypt and He has likewise saved you from slavery to sin. You are saved from the punishment of sin. You are saved from eternal death. You are saved to call on God’s name in prayer and praise. And because you cling to this Word of God, you will never see death. Amen. Dear recipients of comfort: Grace, mercy, and peace to you from God the Father and our Lord and Saviour Jesus Christ. Amen. “Let not your hearts be troubled.” When Jesus says this to you, it is not the same as when the world says it to you. It’s not the same as the world’s “Don’t worry; be happy” or the world’s “Everything’s going to be alright.” From the world, these are merely empty platitudes; clichés spoken because the world has nothing better to say. I know what many of you are going through, as well as those who cannot even make it here on Sundays because they are shut in or in hospitals. Cancer. Alzheimer’s. Diabetes. High blood pressure. Depression. Disabilities. Infections. Heart attacks. Strokes. The list goes on. That’s not even to get into what the families affected go through, watching their loved ones so afflicted or mourning their death. “Don’t worry; be happy”? Save your empty fluff. “Everything’s going to be alright”? Since when is suffering and death alright? No, save the hollowness of those words. Those empty phrases give no comfort. They give no joy and they give no hope. Such empty phrases don’t bring joy, nor do they make anything alright. Do not think for a minute that Jesus’ words to you are of the same sort. They’re not of the same sort because they’re not empty or hollow. Jesus says, “Let not your hearts be troubled.” When Jesus tells you not to be troubled or afraid, He gives you a reason for it. That reason is twofold. First, because Jesus gives you peace. Second, because He goes to prepare a place for you. Let not your hearts be troubled because I am about to give you peace with God the Father by suffering hostility and hatred for you. I am about to earn you forgiveness and freedom from eternal suffering. That’s exactly what Jesus did on the cross. What we need to realize is that all the sickness and affliction in the world is because of us and our sins. We would never get sick or suffer in any way if we weren’t sinful. We would never die if we weren’t sinful. If we loved God with our whole heart and our neighbours as ourselves, we would never be troubled or afraid of anything. We would have peace in ourselves and would have no need of Jesus. Since we are sinful, we do not follow God’s will for our lives. We sin in thought, word, and deed. We deserve nothing but temporal and eternal punishment. We deserve suffering and death in this life and we deserve suffering and eternal death hereafter. God would not have it so. He loves us so much that He sent Jesus Christ, His only Son, to bear the punishment of all of our sins. He suffered so that we have peace with God and the price of our sins is paid. Because of this, Jesus says to you, “Let not your hearts be troubled, neither be afraid.” You do not need to fear the suffering of this life or even be troubled in death because all of your sins are forgiven and you have peace with God. Jesus’ death in your place has taken the sting out of death. And Jesus ascended into heaven to prepare a place for you. You have a place being prepared for you that is not a nursing home or a hospital bed, but an eternal dwelling place with God in the new heavens and the new earth. It is a place of eternal bliss and joy and without sickness or death or sin. It is where we will dwell with God forever, seeing Him face to face. When Jesus says “Let not your hearts be troubled,” He gives you the reason why you have nothing to fear: your sins are forgiven, you have peace with God, and He is preparing a place for you in eternity. This Good News is what Pentecost is about. Pentecost isn’t about speaking in tongues. Pentecost isn’t about miraculous signs. Pentecost is about the Holy Spirit bringing to you the Good News of the Gospel so that you will know that your heart has no reason to be troubled and that you need to fear nothing. This message is so important that The Holy Spirit made sure that all those in Jerusalem heard it in their own language. This message is so important that the Holy Spirit still sends pastors and missionaries to bring this Good News to nations around the world in their own language. The Holy Spirit brings to you the treasures that Jesus won for you. Jesus won for you the forgiveness of sins, peace with God, and eternal life. But how can you get those treasures? How can you receive these gifts that Jesus earned for you? You cannot find these treasures out in nature. You cannot find these treasures inside yourself. You cannot find the gifts of God anywhere except where the Holy Spirit gives them. The Holy Spirit brings these gifts to you in the means of grace – that is, in the Gospel and in the sacraments. The Holy Spirit gives these gifts to you when you hear Jesus’ words that tell your heart not to be troubled because you have peace with God since your sins are forgiven. The Holy Spirit gives these gifts to you when water is poured over your head in the name of the Father and of the Son and of the Holy Spirit according to Christ’s command and promise. The Holy Spirit gives these gifts to you when you eat and drink the true body and blood of Christ given into death for you for the forgiveness of sins according to Christ’s command and promise. That’s what Pentecost is about. It’s about the Holy Spirit bringing you Jesus. It’s about the Holy Spirit giving you the treasures through Word and Sacrament that Jesus earned for you by His life, death, and resurrection. That is the work of the Holy Spirit. So let not your hearts be troubled. Whatever afflictions and tribulations you are facing and are still to face in your future, know that you have nothing to fear. You have peace with God through the death of Jesus since all your sins are forgiven. You have a place being prepared for you in eternity. And the Holy Spirit continues to work in you through the means of grace to keep you in the faith, to strengthen you in the faith, and to comfort your troubled heart. Let not your hearts be troubled, neither let them be afraid. Amen. Dear Church of God: Grace, mercy, and peace to you from God the Father and our Lord and Saviour Jesus Christ. Amen. Jesus prayed and still prays that His Church would be perfectly one. He doesn’t pray that we would be similar or mostly in agreement or almost completely united. He prays that we would be perfectly one. Seems pretty far-fetched, doesn’t it? I found 38 Lutheran denominations on an online list in North America alone. It is difficult to determine how many total denominations exist in the world, but it is in the thousands. Some estimate that there are over 33,000 different denominations in the world. I think that estimate is too high, but the point remains the same: the church on earth is divided not united. Certainly not perfectly one. How can this be? The world looks at the church and says, “Look at all the division! You want me to believe in this Jesus but you can’t even agree on what He says?” It is an offence and a shame and the world is right with such accusations. They don’t know what to believe and we, as the church on earth, are not helping that. Why are there so many divisions? There’s actually a simple answer to that question. It is because of our sin. It is because people would rather follow anything than what the Bible says. If God’s Word condemns your sin, the sinful flesh would rather dismiss God’s Word as irrelevant in this day and age than repent and turn away from sin. If God’s Word says something hard to understand, human reason would rather dismiss God’s Word as irrational than accept it as true. If God’s Word says something that doesn’t feel right to our sensibilities, our feelings would rather dismiss God’s Word as overly harsh than believe what it says. There are those think the solution to our divisions is to dismiss and ignore the differences between denominations. They think that diversity in Christian doctrine is a good thing – something like giving people an opportunity to pick their favourite foods from a smorgasbord. That’s certainly not what Jesus prays. Jesus prays that we would all be perfectly one. Saint Paul exhorts the churches in Corinth saying, “I appeal to you, brothers, by the name of our Lord Jesus Christ, that all of you agree, and that there be no divisions among you, but that you be united in the same mind and the same judgment.” (I Cor. 1:10) Differing opinion on doctrine is not a good thing. It is harmful and sinful. It divides the church. When Jesus sends His ministers to make disciples of all nations, He says, “Go therefore and make disciples of all nations, baptizing them in the name of the Father and of the Son and of the Holy Spirit, teaching them to observe all that I have commanded you.” (Matt. 28:19-20) Jesus doesn’t tell them to pick and choose what parts of doctrine they are to teach. He doesn’t tell them it’s acceptable to discard those things that people don’t like. Jesus instructs them to teach people to observe all that He has commanded. It is Jesus’ prayer that we are perfectly one. There certainly are Christians in denominations other than ours. We have never denied that, nor should we. The concern is that denying the clear words of Jesus leads people away from Jesus and puts faith into peril of being lost. If you cannot trust Scripture that Baptism saves, how can you trust Scripture that faith saves? If you cannot trust Scripture that the Lord’s Supper is the true body and blood of Christ, how can you believe Scripture that Jesus gave His body into death and shed His blood for you? If you cannot trust Scripture that an indulgence cannot save you, how can you trust Scripture that Jesus has saved you? There is great danger in denying any matter of doctrine taught in Scripture because it leads you to question whether you can trust Scripture at all. Of course this is not about finger pointing. Finger pointing gets us nowhere, certainly not to unity. Our primary concern must be what we believe. We must not take matters of doctrine lightly as if it doesn’t matter what we actually believe. We must study Scripture to learn God’s truth. We should study particularly those things in Scripture that our human reason would dismiss as irrational; those things that attack our sensibilities; those things that hit close to home, so that our stubborn sinful wills might be changed by the Word of God to align with God’s good and perfect will; that we would be one as Jesus prays that we would be. Unity cannot be achieved by ignoring doctrinal differences as we already heard. Force or coercion won’t work either. You cannot force someone to believe anything. The only hope that the church has for unity is the Word of God. The Word of God creates unity. The church cannot create unity. We cannot create fellowship. God creates unity and fellowship; we simply recognize it where it exists. God creates unity through His Word as we learn all that Christ has commanded. The sad reality is that in this sinful world, we are not likely to have unity in doctrine. Baptists aren’t going to start baptizing babies and Lutherans aren’t going to stop. The United Church won’t start caring about doctrine and we’re not going to stop. The Roman Catholic Church won’t stop granting indulgences and we’re not going to start. The sad reality is that the clear words of Jesus will not be confessed in unity by all. But this is not reason to despair. Jesus knows His own. He knows those of us who belong to Him in our denomination, and He knows those who belong to Him from every denomination on earth. Jesus isn’t going to cast His sheep aside because they do not understand some matters of doctrine. He’s not going to forsake those who belong to Him because they belong to a church body that is not teaching what He commanded them to teach. But since the danger remains for those who hear falsehood that they would believe it, Jesus prays that the church would be perfectly one, without division; that the church would be united in all that He has commanded. Thus we also pray that the church would be perfectly one; united in faith and doctrine. We pray that we would be guided in the truth of God’s Word and that God would heal all divisions among us. Our church body and congregations are also under continual attack by the devil, that is why we see divisions even among us. We see congregations that wander from what we believe and confess, and introduce practices that are unscriptural. We see pastors who seek the easy road and cease teaching all that Jesus commanded. We see that we are not perfectly one. Let us pray for unity as Jesus prayed for unity. Let us pray that God would make us perfectly one. Let us pray that God would open our eyes to understand His Word so that we would not be misled by false doctrine. True doctrine is the most comforting thing in the world because it gives us Jesus. The doctrine of Baptism tells us God has made us His children and given us the forgiveness of sins. The doctrine of the Lord’s Supper tells us that Jesus gives us forgiveness and strengthens our faith through His true body and blood. The doctrine of the Gospel tells us Jesus died for our sins and we have the promise of eternal life. Let us cling to the truth of God’s Word and suffer all, even death, rather than fall away from it. And let us pray that God would make us perfectly one through His saving Word. Amen.